It's long been known that secret messages can be included in music through techniques such as backmasking, but now a Polish researcher has developed an entirely new approach. By subtly varying the tempo of a particular type of dance music, he's managed to encode information in a way that's completely inaudible to human listeners. 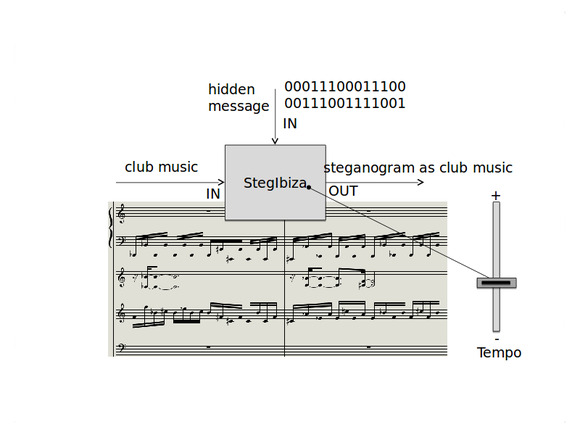 StegIbiza is an algorithm for hiding information in a type of dance music known as Ibiza, which originates on the island by the same name in the western Mediterranean Sea. Ibiza music is characterized by its trance-like beat, and that's what Krzysztof Szczypiorski, a professor at Poland's Warsaw University of Technology, made use of. To create his approach, Szczypiorski began by developing a sort of Morse code by which the dots and dashes that would represent letters are converted instead into a faster or slower tempo for a particular beat. To prove his concept, he used Apple's Logic X Pro music production software to create covers of five popular songs: “Lily was here” by David A. Stewart and Candy Dulfer; “Miracle” by Queen; “Rhythm is a dancer” by Snap! ; “So what” by Miles Davis; and “You were the heart's beat” by Andrzej Zaucha. The songs were arranged without vocals in techno, hip-hop, and trance styles using the instruments available in Apple's software. From there, Szczypiorski embedded the message “steganography is a dancer!” in each song, placed randomly. Szczypiorski varied the degree to which tempos were altered as part of his encoding technique to see when those changes became discernable to human ears. He then tested his approach in both a studio setting where participants wore headphones and an open-air setting where a DJ was in control. Across both, he found that tweaks of less than 1 percent didn't get noticed at all. That means that StegIbiza could be a viable means of encoding information in music, and Szczypiorski suggests that software could be created both to code and decode music this way, with potential applications in security. His paper is now available online.